Thursa Middlebrook was born on 20 May 1876 in Templers, South Australia , daughter of Richard Middlebrook and Mary Rowe. On 13 December 1901, Thursa, aged 25, married Edgar James Albert Haines, aged 27, son of James Haines and Mary Jane Cole. Thursa was buried on 15 June 1946 in the Centennial Park Cemetery, Pasadena, South Australia , Grant No. 2243 Section GC Row 3 Site No. 265. Harry Edgar Haines was born on 20 October 1902 in Wallaroo, South Australia , son of Edgar James Albert Haines and Thursa Middlebrook. Leonard James Haines was born on 26 January 1905 in Wallaroo, South Australia , son of Edgar James Albert Haines and Thursa Middlebrook. Harriet Edwards was born on 23 June 1872. In September 1893, Harriet, aged 21, married Herbert Haines, aged 27, son of Henry Haines and Kezia Elizabeth Flavel. She died on Sunday, 26 May 1946, aged 73 years, 11 months and 3 days, in Melbourne, Victoria, Australia . Myrtle Haines was born in 1894, daughter of Herbert Haines and Harriet Edwards. She died in 1971, aged 77 years. Clive Flavel Haines was born in 1896, son of Herbert Haines and Harriet Edwards. He died in 1960, aged 64 years. Eva Haines was born in 1898, daughter of Herbert Haines and Harriet Edwards. She died in 1966, aged 68 years. Herbert Haines was born in 1900, son of Herbert Haines and Harriet Edwards. He died in 1960, aged 60 years. Edwin Gooding was born on 12 September 1870 in Tea Tree gully, South Australia , son of Thomas Gooding and Elizabeth Tregeagle. About 1892, Edwin, married Polly Haines, daughter of Henry Haines and Kezia Elizabeth Flavel, in Victoria, Australia . He died on Sunday, 23 April 1944, aged 73 years, 7 months and 11 days, in Victoria, Australia . Edwin was buried on 25 April 1944 in the Dimboola, Victoria, Australia . Harold began military service on 1 October 1915 in Dimboola, Victoria, Australia , where he enlisted. His service number was 19796. He was appointed to the 8th Field Artillery Brigade, 30th Battery. He died on Sunday, 30 September 1917, aged 24 years and 1 month, in Belgium Killed in action. 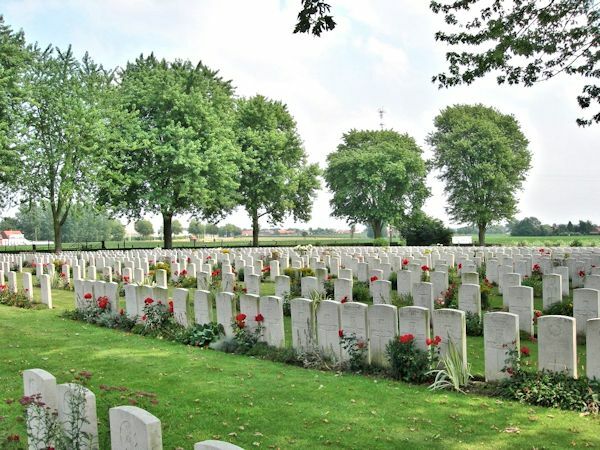 At the time of his death his rank was Gunner in the 8th Field Artillery Brigade.